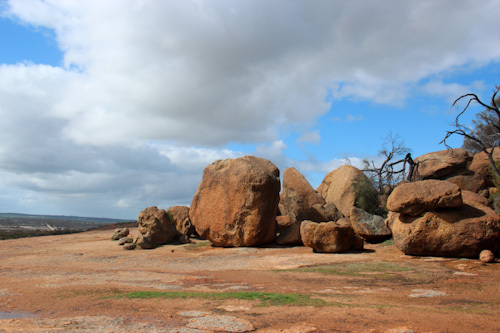 Western Australia has a number of large granite rock formations — similar to Uluru in the Northern Territory. One part of a large isolated rock has been weathered in a spectacular fashion so that it looks like a huge breaking wave. 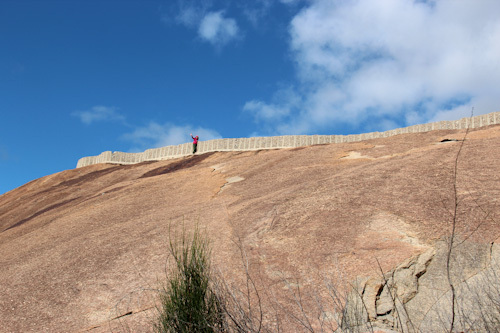 Today we stopped by Wave Rock for a look and a climb. 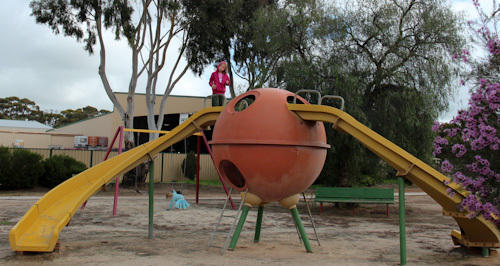 The town of Hyden is located close to Wave Rock and caters for the large numbers of visitors that pass through on the way to the national landmark. 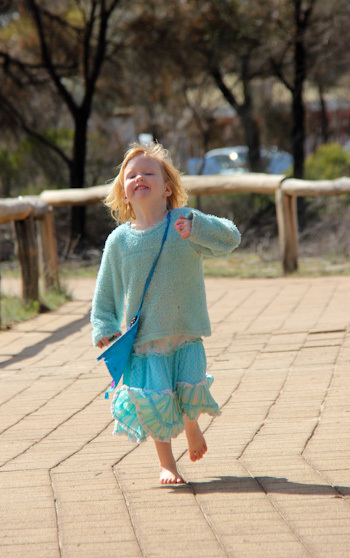 Lana enjoys the run on the path that leads to Wave Rock. The erosion of the side of this huge rock transforms it into a breaking wave. It doesn't take long for Brioni to climb up the side of the rock. The wall along the top is part of a water-catching structure. We climb the steps leisurely to reach the top. 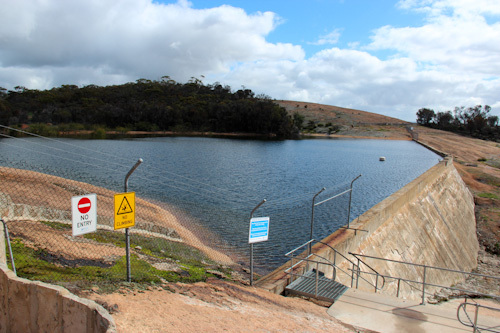 The dam is used to collect drinking water for the community that lives around Wave Rock. There's been a lot of rain across this section of the country recently, and it turns everything nicely green. 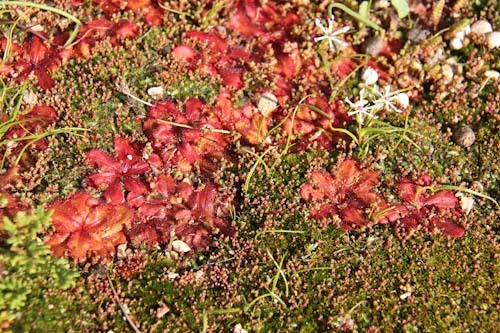 As well as taking in the landscape around us, I love to bend down and admire the tiny flowers that grow in the moss on top of the rock. 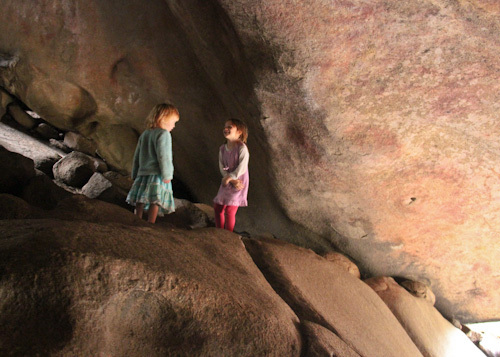 These boulders hide little caves and pathways that our girls love exploring. 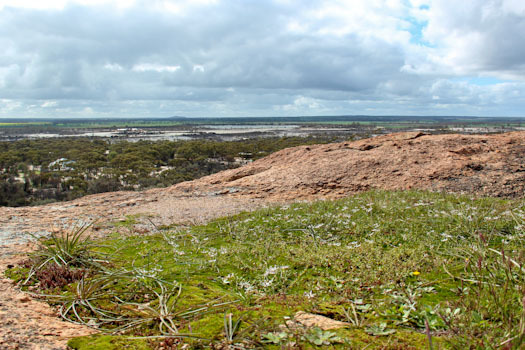 Less than twenty kilometres from Wave Rock, another granite formation — the Humps — rises from the flat plain. As we drove past the rain-soaked fields, past green wheat and fluorescent yellow canola, we could see the rocks rising out of the flat. 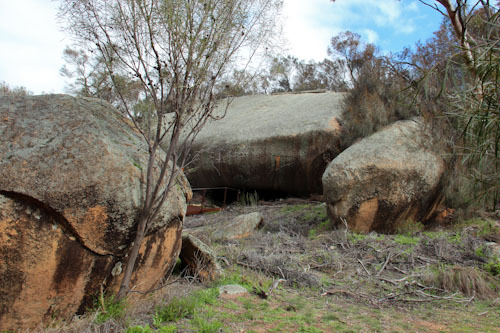 One section of the Humps contains a cave with significant Aboriginal rock-art. Although the paintings are fading, the cave is extremely accessible to visitors and signs explain the historical significance of the decorations. Thanks to the paths, Mulka's Cave is easy to find among the granite boulders. As the girls play in the cave, I try to imagine living in this space — or even just spending one night in here. Even though we're covering long stretches of flat, featureless road, occasionally we see something so bizarre we have to stop and investigate it further. 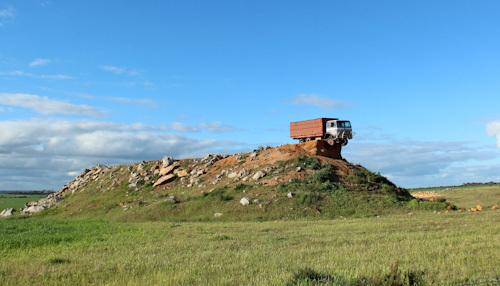 We couldn't come up with an alcohol-free story that placed this truck so precariously on top of the rock pile! Making these stops breaks the long hours of driving. Even though we’ve been visiting places we’ve seen in the past, I’ve found the familiarity of the landmarks is just as appealing as their initial novelty. I love the outback, something draws me there and I this girl who was brought up in the suburbs feels strangely at home amongst the red dust and blue skies. 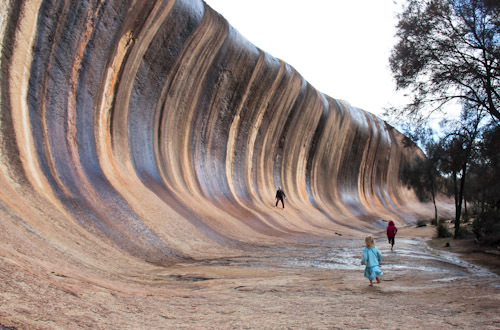 We missed out on wave rock when we were in WA but I hope to visit there some day!